Now that the Apple iPad tablet has been weighed and measured by a captive Internet audience, did the device meet its ginormous expectations or was it found wanting? As with many things, the answer will depend on who you ask. In the meantime, here's a rundown of features to help you learn more about Apple's new iPhone/MacBook tweener. If there's one thing that many seem to agree on, it's that the Apple iPad tablet features a really nice display. The screen measures 9.7 inches diagonally and sports a glossy, LED-backlit In-Plane Switching display. The high-resolution screen has 1024-by-768 pixels at 132 pixels per inch and also has a fingerprint-resistant coating. The Apple iPad tablet is a half-inch thick, 9.56 inches tall and 7.47 inches wide. The Wi-Fi model weighs in at 1.5 pounds while the Wi-Fi+3G model comes in a smidgen heavier at 1.6 pounds. Driving the Apple iPad tablet is a 1GHz Apple A4 that Apple claims is custom-designed to deliver good performance while consuming less power. Capacity comes in three flavors: 16GB, 32GB, and 64GB — all flash drives. Like its little older brother, the iPhone, the Apple iPad tablet has an accelerometer that automatically adjusts screen orientation horizontally and vertically. It also has an ambient light sensor. Other features include built-in speakers, a microphone, GPS and a compass (yes, a compass). Apple's iPad tablet has a built-in rechargeable lithium-polymer battery. Apple claims that the battery delivers up to 10 hours of Web surfing via Wi-Fi, music listening, and even watching a video. If that holds true, then that's quite good, especially for frequent travelers or people who take long plane flights. Charging of the device can be done via a power adapter or connecting it to a computer via USB. Surrounding the screen is a black bezel that's supposed to help users hold the device without inadvertently clicking on the touchscreen. The iPad features Apple's minimalist design and only has four buttons. On the top right is a button that serves as an on/off and sleep/wake switch. Two buttons for muting and volume adjustment can be found on the upper right-hand corner. Then there's the Home button on the middle-lower part of the device's face. Of course, given that the iPad is touch-enabled, the small number of buttons is really no surprise. Wi-Fi (802.11 a/b/g/n) and Bluetooth 2.1 (with EDR technology) come standard for all Apple iPad tablets. Higher-end models also have 3G thrown in for good measure, with AT&T once again providing data plans: $14.99 for a 250MB plan and $29.99 for an unlimited plan. The plans don't require contracts and can be canceled at any time. Use of AT&T Wi-Fi hotspots is also free. For audio, the Apple iPad tablet supports: AAC (16 to 320 Kbps), protected AAC (from iTunes Store), MP3 (16 to 320 Kbps), MP3 VBR, Audible (formats 2, 3, and 4), Apple Lossless, AIFF, and WAV. For image and documents, the device supports JPG, TIFF, GIF, Microsoft Word, Keynote, Numbers, PowerPoint, Excel, PDF, HTM, HTML, TXT, RTF, and VCF. The iPad will also support EPUB via its eBook app. For video: H.264 video (up to 720p, 30 frames per second; main profile level 3.1 with AAC-LC audio up to 160 Kbps, 48kHz, stereo audio in .m4v, .mp4, and .mov file formats); MPEG-4 video (up to 2.5 Mbps, 640 by 480 pixels, 30 frames per second, simple profile with AAC-LC audio up to 160 Kbps, 48kHz, stereo audio in .m4v, .mp4, and .mov file formats). Video output includes 1024 x 768 with the Dock Connector to VGA adapter; 576p and 480p with Apple Component A/V Cable; and 576i and 480i with Apple Composite Cable. Pricing starts at $499 for the 16GB version, $629 with 3G. For the 32GB iPad, it's $599 for the Wi-Fi version and $729 for the Wi-Fi+3G version. The 64GB iPad costs $699 and $829 respectively. 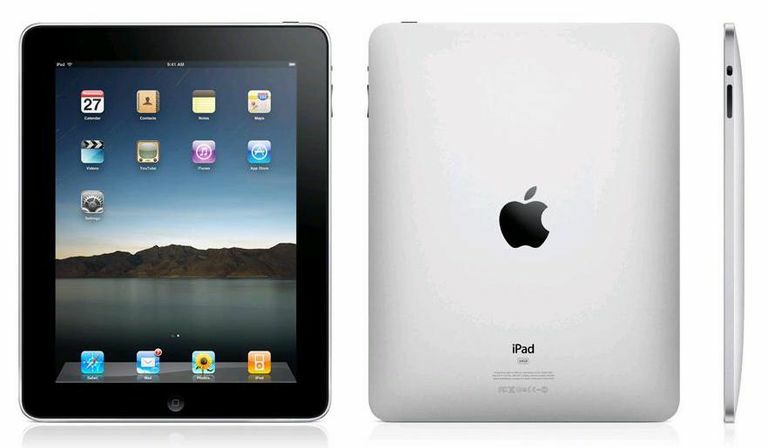 The Wi-Fi iPad starts shipping in 60 days (from Jan. 27) while the Wi-Fi+3G model starts shipping in 90 days. Where's the Rest of the Beef? Almost as interesting as what the device has is what got left out, which will no doubt disappoint some gadget lovers. At the top of the list is multi-tasking — or the lack thereof. As much as Steve Jobs slammed netbooks for "not being better than anything" at the iPad event, they at least allow you to have several applications running at the same time. Maybe they can fix this eventually but it's a real missed opportunity. Then there's the lack of Flash support. Even with Flash's flaws, this is a glaring omission for a device touted as "the best way to experience the web." The device also doesn't have a camera — something even some eBook readers are starting to offer. And if you like to do a video chat, well, the omission of a camera pretty much makes that impossible. As far as connections, I can live with the lack of HDMI but it would've been nice if the device at least had a USB socket standard. Overall, the Apple iPad tablet is a device that excites with its promise and frustrates with its "what-could-have-beens." For now, I wouldn't pass final judgment on a device that has yet to hit the ground running. There's certainly a lot of potential for the iPad in terms of apps and all sorts neat things that can be cooked up for it. And it already does a few things quite well — it's quick, has a nice screen and has that smooth, easy-to-pick-up interface iPhone users are familiar with. But for a company that did so many things right with the iPhone, it's frankly surprising that Apple dropped the ball on what seems to be some pretty obvious needs for the device. Hopefully, those needs ultimately get addressed in the near future. That way, the device will be what it should be instead of making people think about what it could have been. The iPad certainly looks like an Apple device. I'm just not quite sure that it quacks like one just yet. Jason Hidalgo is Lifewire.com’s Portable Electronics expert. Yes, he is easily amused. Follow him on Twitter @jasonhidalgo and be amused, too. You can also check our Tablets and Smartphones hub for more features on touchy-feely devices.